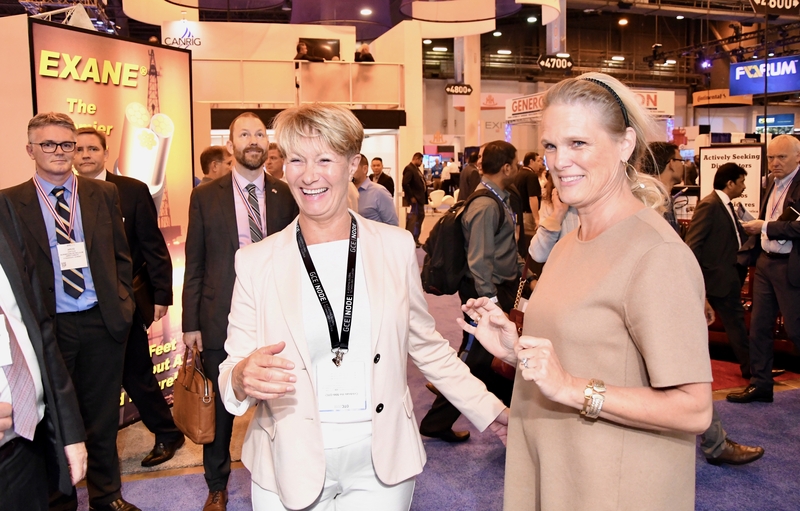 State Secretary Ingvil Smines Tybring‐Gjedde at the Ministry of Petroleum and Energy (right) visited the GCE NODE stand at OTC 2018. Left: Anne-Grete Ellingsen, CEO of GCE NODE. Back in May at OTC, the world’s largest oil expo, it was as if optimism unveiled itself for the first time since 2014. True, there was no cheering heard in Houston, but still the sense of optimism was almost palpable. Cyclical. The oil and gas industry, and the associated maritime industries, are cyclical. The phrase has been repeated constantly since oil prices stooped from record-levels to very gloomy levels. Right now, in a cyclical industry, expressing optimism generally translates to a belief in having “bottomed out” of yet another cycle. If that is the case, we are looking at an upturn. An upturn does not appear from nowhere. The whole industry has made an enormous effort and produced a gigantic turnaround, which has produced new projects both in Norway and globally. Several Norwegian suppliers have won contracts due to increased competitiveness created in the turnaround. The last few years have been challenging for GCE NODE companies and for people that have lost their jobs. An entire industry went through a restructuring process that was necessary in order to win new contracts, but also an opportunity to explore new business possibilities, such as offshore wind, subsea mining, geothermal drilling and fish farming in open waters. Now, the challenge is to maintain the competitiveness we have achieved, also with prospects of increasing oil prices. Digitalization is the key to maintained competitiveness, increased safety and lower emissions to air and water. For the digital shift to be successful, the industry must share more operational data. We need to focus on the different enabling technologies like robots, 3D printing, artificial intelligence and more. The digital shift also means new ways of cooperation between suppliers and costumer throughout the value chain, revised standard contracts, and in many cases new business models. The Konkraft report, published in January, clearly points this out. Now we are waiting for the major operators to lead the way and define standards and expectations to its chain of suppliers, which consists of both SMEs and large suppliers and service companies. We also look for the major players to guide the way in order to reach industry targets defined by the industry report “Roadmap for increased sustainability” (2016). How the suppliers should contribute and how the contributions should be documented, is something for the major operators and ship owners to define. As suppliers, we are ready to play our part. As a cluster, GCE NODE has grown to more than 100 participants. Many newcomers are startups initiated by people laid off during the downturn. GCE NODE, in cooperation with incubator Innoventus Sør, is now developing a set of tools and programs to help these companies scale up and grow their businesses nationally and internationally. We continue to be committed to our two strategic goals: Increased competitiveness in existing markets, and transfer of competence and technology to new markets. The latter is exemplified by our recent trip to Japan, where we met with Japanese suppliers and Equinor to discuss cooperation and business opportunities in floating offshore wind and areas for collaboration within R&D. You can read more about the trip in this newsletter.